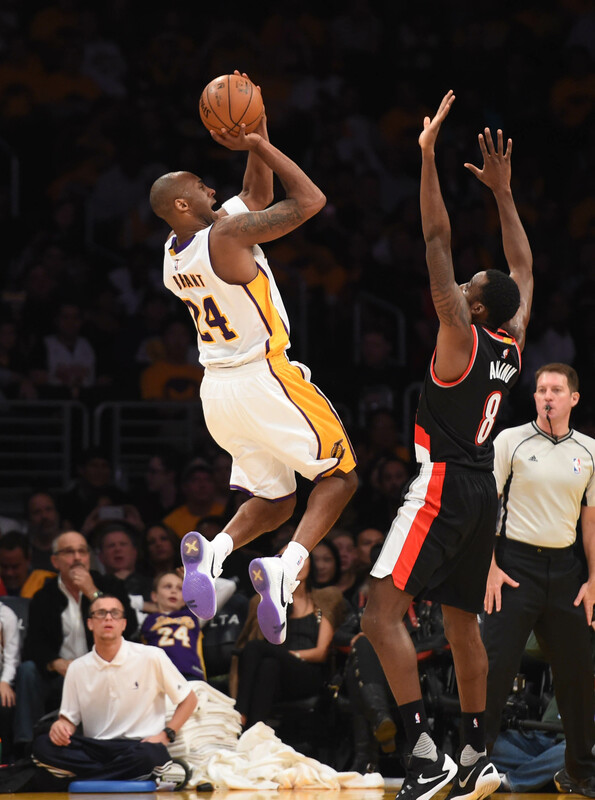 Los Angeles Lakers Kobe Bryant ,24, misses a shot against Portland’s Al-Farouq Aminu,8, during the third quarter at the Staples Center. Los Angeles Calif., Sunday, November,22, 2015. The jolly man laughed. He talked to several children sitting on his lap. He posted for pictures. The kids may have shared what they wanted for Christmas. But the man was not Santa Claus. The man was Lakers guard Kobe Bryant, who became the center of attention during the franchise’s annual holiday party for 60 kids from School On Wheels, a tutoring service for homeless students. Either way, Bryant may receive one Christmas gift that will come two months later. NBA Commissioner Adam Silver had argued Bryant should appear in the 2016 NBA All-Star game in Toronto on Feb. 14, 2016 during his 20th and final NBA season. This would normally mark a no brainer for Bryant, who has been voted in for 17 All-Star games. But he has averaged only 16.5 points on 33 percent shooting, 4.1 rebounds and 3.6 assists. Bryant’s global popularity should offset those issues. Bryant should also benefit from being listed as a frontcourt player after manning the small forward position. He will not have to compete for a backup spot against Stephen Curry, James Harden, Chris Paul or Russell Westbrook. But Bryant could also appear in the game on merit. In the past five games, Bryant has averaged 18.2 points on 47.2 percent shooting and 4.2 assists.